She then asked the assembled faculty to write down their own reactions to the statement and discuss them in small groups. The reactions our colleague heard were both positive and predictable: a lot of talk about the influence of students' family, school climate, and a sense of connectedness within the school on academic achievement. When the conversations drew to a close, our colleague shared the school's discipline data from the previous year, which showed that suspensions occurred at rates disproportionate to the student population. In a majority of cases, the most serious offense was identified as defiance—a nonviolent act, and one that is broad and vaguely defined. This is not an uncommon finding: According to a report of suspensions in California schools, 34 percent of suspended students were punished for defiance or disruption (Losen, Martinez, & Okelola, 2014). Our administrator friend had calculated the number of instructional days lost to suspensions and provided comparative data on the grade point averages of suspended students versus those who had never been suspended. She then asked the faculty whether they were building strong children or ensuring that their communities will have future broken adults in need of repair. The frank 30-minute discussion that ensued inspired the school's staff to create a culture in which restorative practices could thrive. Over countless department meetings and informal exchanges, the staff performed yeomen's work analyzing and redefining classroom and schoolwide practices. Our own experience has been that while our collective hearts as educators are in the right place, we tend to make decisions based on past experience. After all, we began our on-the-job training as teachers when we were five years old. Our beliefs about school, classroom management, and discipline have been shaped by decades of experience, starting in kindergarten. What we need is an effective classroom-management system—one that we can hold onto in times of stress and strife. The term classroom management is confusing and misleading, mainly because it has no clear and widely agreed-upon definition. For some, the term refers to general control of students; for others, it refers to discipline procedures; for others still, it refers to both routines and procedures. Up until recently, we have avoided using the term, but we finally came across a definition we could stand behind: Cassetta and Sawyer (2013) define classroom management as being "about building relationships with students and teaching social skills along with academic skills" (p. 16), and we couldn't agree more. There are two aspects of an effective learning environment (and, by extension, successful classroom management): relationships (specifically, the range of interpersonal skills necessary to maintain healthy relationships) and high-quality instruction. When students have strong, trusting relationships both with the adults in the school and with their peers, and when their lessons are interesting and relevant, it's harder for them to misbehave. We don't expect an effective classroom-management system to eliminate all problematic behavior any more than we expect a new set of standards to raise all students' scores by leaps and bounds on the first try. Students are going to misbehave as they learn and grow—it's how we respond to their misbehavior that matters. We believe that students should have a chance to learn from their mistakes and to restore any damaged relationships with others. Our view is known as the restorative approach to discipline. The table in Figure 1.1, developed by the San Francisco Unified School District, illustrates the differences between the restorative approach and the traditional approach to discipline. Schools and rules are violated. Justice focuses on establishing guilt. Accountability is defined as punishment. Justice is directed at the offender; the victim is ignored. Rules and intent outweigh the outcome. No opportunity is offered for the offender to express remorse or make amends. People and relationships are violated. Justice identifies needs and obligations. Accountability is defined as understanding the effects of the offense and repairing any harm. The offender, victim, and school all have direct roles in the justice process. Offenders are held responsible for their behavior, repairing any harm they've caused and working toward a positive outcome. Opportunities are offered for offenders to express remorse or make amends. Source: Adapted from San Francisco Unified School District. (n.d.). Restorative practices whole-school implementation guide (p. 19). San Francisco, CA: Author. In its contemporary incarnation, the restorative practices movement is an offshoot of the restorative justice model used by courts and law-enforcement agencies around the world. In the restorative justice model, mutually consenting victims and offenders meet so that the former can be given a voice and the latter can have an opportunity to make amends. Importantly, this approach empowers a community to take an active role in resolving problems. Cultures throughout the world employ restorative justice to create peace among adversaries, ensure restitution, and make decisions at times of community crisis. Restorative practices in schools cast a wider net than restorative justice in the courts. Whereas justice is by its nature reactive, restorative practices also include preventive measures designed to build skills and capacity in students as well as adults. Restorative practices are predicated on the positive relationships that students and adults have with one another. Simply said, it's harder for students to act defiantly or disrespectfully toward adults who clearly care about them and their future. Healthy and productive relationships between and among students and staff facilitate a positive school climate and learning environment. In the restorative approach, when relationships in the school become damaged, the parties involved are encouraged to engage in reflective conversations that help offenders understand the harm that their actions caused and provide them with opportunities to make amends. As we describe further in this book, there are a number of ways to build relationships and create healthy learning communities. Circles. Teachers in the restorative practices movement promote a sense of family in the classroom by having students sit in circles to discuss both curriculum-related topics (e.g., the role of genocide and war in a World History class) and noncurricular issues that bear discussing (e.g., how students might manage stress on the eve of a major state exam). Individual conferences to address problematic behavior. We'll explore the details of these high-stakes meetings in greater detail further in the book, but for now know that restorative practices are not about letting things go or ignoring when harm has been done. Individual conferences require intense preparation on the part of the victim(s), the perpetrator(s), witnesses to the conflict, and anyone else who's been affected by it. In some cases, conferences involve two sets of parents or guardians who are very much at odds with each other: it's common for the offender's family to lobby for mercy and for the victim's family to demand retribution. To ensure that conferences run smoothly, it is crucial to engage with families preventively, before crises occur. The criminal justice system. In a small number of cases, the criminal justice system will play an important part in a restorative approach to student discipline. We have found that strong ties to our local police department and juvenile justice system have enhanced our ability to play a meaningful role in the lives of adjudicated youth, allowing us to partner with families and the courts to positively affect students' lives. In fact, many youth court systems follow the restorative approach to justice, which mandates therapeutic interventions over retributive ones. We have personally been fortunate to work with skilled police and youth probation officers who have received formal training in restorative practices. Traditional school discipline practices are considered separate from the academic mission of the school. By contrast, restorative practices are interwoven into every interaction in the building. At your school, is a specific administrator assigned to disciplinary matters? This might be the principal, vice principal, or dean of students. Ask a few students at your school, "Where do kids go when they misbehave?" If you keep hearing a specific person's name—or worse, a specific practice (e.g., "Kids go home 'cause they get suspended")—then you know that your school is pursuing a traditional approach to discipline. If this is the case, it's time for a change. It's far too common in schools for educators to wait for discipline problems to emerge and then handle them on a case-by-case basis. Such an approach leaves adults exhausted and children with limited skills development. We don't leave the acquisition of reading or mathematics skills to chance; we engage in explicit, systematic, and intentional instruction to ensure that learners progress academically. So why wouldn't we do the same to ensure that students progress socially and emotionally? The social and emotional development of students is often poorly articulated in schools—relegated to an assembly and a few accompanying lessons. Traditional tools for addressing behavioral issues among students—rewards and consequences, shame and humiliation, suspensions and expulsions—run counter to a restorative culture and do not result in lasting change, much less a productive learning environment. Right now you may be thinking to yourself: I've got a whole list of rewards and consequences in place to manage behavior. 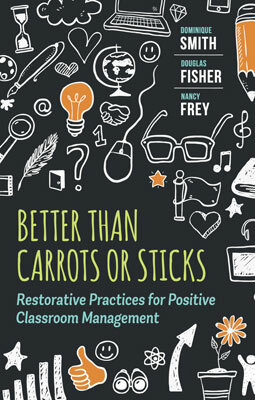 To be sure, nearly every classroom-management book will have a section devoted to the use of rewards and consequences. But there's one problem: Rewards and consequences don't work—or at least, they don't teach. They may result in short-term changes, but in reality they promote compliance and little else. You may be thinking to yourself: I don't use punishments. My students earn points and privileges for good behavior. Some people think that bribing students with an ice-cream social or a movie day when they behave is somehow better than meting out consequences when they don't. In reality, rewards and consequences are two sides of the same coin: both are attempts to control students' behavior rather than teach them how to engage in productive learning. Tangible rewards have actually been shown to undermine motivation (Deci, Koestner, & Ryan, 2001). Rewards suggest to people that they are being compensated for engaging in an unpleasant obligation. Importantly, research shows that good behavior diminishes as rewards are phased out. According to Kohn (2010), "Scores of studies have confirmed that rewards tend to lead people to lose interest in whatever they had to do to snag them. This principle has been replicated with many different populations (across genders, ages, and nationalities) and with a variety of tasks as well as different kinds of inducements (money, As, food, and praise, to name four)" (p. 17). Because students begin to lose interest with what they're doing, over time the number or value of the rewards offered to them must increase if they are to remain on task. Why do we punish students by meting out "consequences" when they misbehave? Probably because we experienced punishment as students ourselves. The most common punishment for student misbehavior in elementary school is loss of recess (Moberly, Waddle, & Duff, 2005)—ironic, given that evidence has shown regular physical activity to reduce problematic behavior and increase student achievement (Ratey, 2008). Another common punishment: placing students' names on a board and applying checkmarks by those of students who've misbehaved. Such attempts to hold students publicly accountable for their behavior can render them compliant but can also make them feel anger, humiliation, and a range of other negative emotions that serve to shut down learning (Woolfolk Hoy & Weinstein, 2006). Taking things away from students in the name of improving their behavior and learning can actually do the exact opposite. Can you imagine if we did the same in an attempt to improve faculty behavior? What if you had to stay 10 minutes after work because you talked during a staff meeting? What if your name were singled out on a chart for turning your grades in late? Consider the range of emotions these actions would evoke in you—and realize that children feel these emotions, too. Nancy remembers her first year teaching elementary school. She had taken a classroom-management course as part of her teacher-preparation program, written papers about her philosophy of teaching, and investigated various different management systems. In her student-teaching class, for example, she observed a "stoplight" classroom-management system in which students' names were written on slips of paper and placed in color-coded card stock pockets: green for good behavior, yellow for behavior that had led to a warning, and red for misbehavior that needed to be addressed. When Nancy was hired for her first teaching position, she adopted a similar practice: labeling clothespins with students' names and moving them along a cardboard continuum that ranged from "Outstanding" to "Office." However, it soon became apparent to Nancy that moving clothespins all day long consumed a lot of time that she could otherwise devote to teaching. What's more, the clothespin system had led to little change in her students' behavior; in fact, the children lost interest in the system—and, soon after, in learning. Instead of fewer challenging behaviors, Nancy seemed to be dealing with more. Maybe it's just not the right system, she thought. As a new teacher, she was granted release time to observe teachers at work in other classrooms, so she decided to visit the room of a veteran kindergarten teacher known around the school for her kindness and gentle nature. On observation, however, Nancy found that the teacher's classroom-management system belied her reputation. At the beginning of the school year, she had invited her students to bring their favorite stuffed animals with them to keep in class. The stuffed animals were displayed on a shelf, each one labeled with the name of its owner. Whenever students misbehaved, they were to walk to the shelf and turn their stuffed animals around to face the wall. The looks on students' faces after doing this displayed heartbreaking sadness and anger. Nancy removed the clothespins from her classroom the very next day. She also got rid of the time-out chair. It had dawned on her that the "consequences" she was meting out were actually punishments—and punishments don't teach, they just create more distance between teachers and students. Punishments rely on our ability as adults to leverage an unequal power relationship over children; it puts children in their places by reminding them who's really in charge. Students who are punished will come up with a list of reasons why they are the victims and will channel their negative emotion toward those doing the punishing. Instead of reflecting on their behavior or making amends, they will plot how to avoid detection the next time. As Toner (1986) notes, punishment thwarts the development of empathy in children, who learn instead to look out for themselves regardless of their effects on others. Most troubling of all, punished children learn from adult examples that exerting power is the way for them to get what they want—a notion diametrically opposed to the social and emotional well-being we are trying to foster. It took several years, but Nancy eventually developed new tools to use with students when their behavior proved problematic. She began to spend more time establishing and teaching rules and setting expectations, structuring conversations with students that strengthened relationships and helped develop communication skills, and learning new ways to de-escalate disruptive events. Most importantly, she learned (and continues to learn) that problematic behaviors signal a student's lack of skills for responding appropriately to difficult situations. Just as students need teachers to teach them grammar and math, they need us to teach them how to respond properly to events. Children who are habitually criticized, humiliated, or shamed internalize negative feelings about themselves that hinder their healthy development. By contrast, children accustomed to loving support and guidance are much more likely to become healthy and productive citizens. The traditional consequences-and-rewards system of discipline common in many classrooms is not resulting in children who are prepared to learn. Let's be clear: we're not saying that teachers should completely refrain from rewarding students—just that the rewards should not be contingent on students' behavior. These types of rewards fall under the rubric of "noncontingent reinforcement" (Cipani & Schock, 2010). It's fine to offer rewards "just because," regardless of whether students "deserve" them or not. In fact, noncontingent reinforcement can actually help to prevent problematic behaviors: Have you ever noticed the way kindergarten teachers will sometimes place the most attention-seeking children on their laps when reading aloud to the whole class? This is a classic example of noncontingent reinforcement employed to preempt any disruption. Teachers use noncontingent reinforcement regularly as they build the culture and climate of their classrooms. At any moment in any class, a student may become inattentive or distracted and need to be reengaged. When you have 30 people or more in the same room, order is continuously established, lost, and restored again. People who are not educators marvel at teachers' ability to turn dozens of children into a cohesive unit. When the class is really rolling, we recognize that we're teaching with a sense of urgency that our students share. Of course, things can and will go wrong—our brief attempt at redirecting an inattentive student won't work, or students will refuse to follow our clear directions. Being human, we might find ourselves lapsing into sarcasm or speaking more harshly than necessary. For a minority of teachers, responding in this way becomes an unfortunate habit, turning them into "the mean teachers" whom students know to avoid lest they be run roughshod over. These are the teachers whose students are often lined up near the playground fence because they've been docked a few minutes of recess for misbehaving—a public humiliation reminiscent of the pillory in medieval town squares. Perhaps you count such teachers as colleagues—and perhaps you disagree with their approach to discipline but feel that it's not your place to say anything. Unfortunately, the actions of a single teacher can negatively affect an entire school's climate: not only is the use of shame and humiliation to punish students toxic, but it's also highly infectious, spreading through a grade level or department at an alarming rate. To be clear, we don't believe that teachers who use shame and humiliation as tools are intent on crushing the spirits of their students; we simply believe that they've mistakenly bought into the conventional wisdom that exalts punishment as an effective means of altering behavior. We are not talking here about necessary corrective discipline but, rather, of punishments specifically intended to make children "feel guilty, humiliated, or fearful in an attempt to get them to change their behavior" (Hall, 2013, p. 25). Many of us have been on the receiving end of such punishments. For example, Doug recalls the time one of his high school teachers told him, in front of the whole class, that he'd only ever be able to work at a fast-food restaurant for the rest of his life; when he reacted with anger, the teacher punished him for it. For her part, Nancy can recall being spanked by her 1st grade teacher for neglecting to put her completed worksheet in the right place on the windowsill. No doubt the teachers in these two examples thought they were doing us a favor with their punishments—teaching us lessons that would stay with us in life. Decades later, the only lesson we learned was to associate these teachers' classrooms with feelings of anger and fear. Given the modeling with which they're presented, it's no surprise that many children learn to resolve problems themselves using rewards and consequences—through bullying, for instance. As educators, we invest a lot of attention in teaching students to refrain from hurting their classmates. But when we misuse our power trying to do this, we map a path for students to follow that is the opposite of what we intend. Cyberbullying is one such path that has become increasingly popular among students. Unwelcome as they are, the swift repercussions of digital cruelties have had at least one positive outcome: they have focused society's attention on the serious damage that bullying—behavior learned from "consequences" absorbed earlier in life—can cause, no matter what form it takes. It's becoming less common to encounter educators who associate bullying exclusively with the rites of childhood or who dismiss it as a gender-based trait ("You know how girls are," "Boys will be boys"). Exposure to the effects of bullying behavior has led to parents and students demanding that educators intervene when it occurs. For our part as educators, we need to examine our daily interactions with students and ask ourselves whether we ourselves allow a form of bullying to occur in the name of discipline. Rates of suspension and expulsion have increased dramatically since schools began implementing zero-tolerance (ZT) policies in the mid-1990s. These policies evolved from the 1994 GunsFree Schools Act, which required districts to expel any student in possession of a weapon at school. In short order, many districts expanded the policy to cover a variety of non-weapons-related violations, including possession or use of drugs and alcohol, physical altercations, damage to school property, and multiple violations within a single academic year (Hoffman, 2014). Today, the list of offenses for which some schools have ZT policies in place includes truancy, tobacco use, and a cluster of behaviors described as "defiance." One researcher has described the proliferation of ZT policies as "the criminalization of what many consider to be typical adolescent behavior" (Jones, 2013, p. 741). Although a focus on safety is certainly laudable, the unintended effects of ZT policies—soured school climates, higher dropout rates, and lower performance on measures of student achievement (Skiba & Rausch, 2006)—are not. Another troubling aspect of ZT policies is the fact that they disproportionally affect certain demographic subgroups of students. Black and Native American children, students with disabilities, and males of all backgrounds are overrepresented in national suspension and expulsion data (Hoffman, 2014; Jones, 2013; see Figure 1.2). If you are a black or Native American child with a disability, the likelihood that you will be suspended or expelled from school is astronomical—25 percent for boys and 20 percent for girls. Black students are three times more likely to be suspended or expelled than white students. Females of color (black, Native American, and Native Alaskan) are suspended at a rate of 12 percent, compared to 2 percent for white girls. Students with disabilities represent 12 percent of the school-age population, but comprise 58 percent of students placed in seclusion and 75 percent of those who are physically restrained. Black children represent 18 percent of preschool enrollment, but 48 percent of preschool children receiving more than one out-of-school suspension. By contrast, white students represent 43 percent of preschool enrollment, but only 26 percent of preschool children receiving more than one out-of-school suspension. Boys represent 54 percent of preschool enrollment, but 79 percent of preschool children suspended once and 82 percent of those suspended multiple times. As the data in Figure 1.2 show, even preschool children are being suspended from schools. It's hard for us to imagine what violations three- and four-year-olds might commit that would warrant an extended removal from the learning environment. Many caring administrators have expressed frustration at board policies that require them to mete out such harsh punishments; their professional training has taught them to see the child first—to respond in ways that teach, not punish. Policies that mandate exclusionary punishments rob educators of the ability to make child- and family-centered decisions. More than anyone, teachers understand how vital it is for students to be present in class each day. When we suspend and expel, we undercut our own efforts to boost attendance. Research shows that regular school attendance in the early grades is an excellent predictor of 3rd and 5th grade reading levels (Chang & Romero, 2008) and that a student's 9th grade attendance levels can predict whether or not he or she will graduate high school (Roderick, Kelley-Kemple, Johnson, & Beechum, 2014). When we speak of chronic absences (defined as missing more than 10 percent of the school year), how often do we consider the extent to which existing discipline policies have made the problem worse? According to Skiba (2000), 95 percent of out-of-school suspensions are for nonviolent infractions such as chronic tardiness or "willful defiance." Every child and adult has a right to feel safe and secure in school, but instituting banishments for minor infractions doesn't contribute to the well-being of anyone involved, prevents learning from occurring, and compromises the school climate. The negative effects of suspension and explusion are not limited to students who directly receive the punishment. In a large-scale study of exclusionary discipline practices, Perry and Morris (2014) found that "higher levels of exclusionary discipline within schools over time generate collateral damage, negatively affecting the academic achievement of nonsuspended students in punitive contexts" (p. 1067). In other words, when schools rely on exclusionary disciplinary policies, the achievement of all students is negatively affected. We all understand the need for safe schools—not only physically but psychologically as well. Too often, exchanges in schools serve to tear people down—think of the girl who is shunned in the lunchroom by students she thought were friends or the boy receiving anonymous messages on social media urging him to harm himself. As adults, we shake our heads and tell each other that, unpleasant though it is, bullying is a natural developmental phase. If a child or parent challenges us to intervene, we might bring the parties involved together to try forging a conclusion, but most of the time we're left with the lingering feeling that the conflict isn't over for good. Of course, it's always the big stuff that gets the most attention—a big fight between two groups of students, for example, or any kind of altercation that involves law enforcement. If the event becomes publicized outside of school—especially if it involves any number of factors related to gender, race, language, disability, or sexual orientation—then district or community spokespersons can be expected to announce their opinions of staff and students alike without ever setting foot on school grounds. If a school gets enough negative publicity, it risks becoming a punching bag for the district or region. Even without a media-grabbing incident, a school can earn notoriety: by having the lowest graduation rate in the district, for example, or the worst results on state tests, or high turnover rates among teachers and administrators. Maybe your school doesn't stand out in a bad way—achievement is solidly in the middle of the pack, there hasn't been a major crisis in a long time, and students and teachers go about their business without much friction. But does the school parking lot become empty mere minutes after the school day ends? Do most students choose off-campus activities over school clubs? Do staff members see each other only rarely outside of mandatory meetings? If the answer to any of these questions is yes, then you are burdened with a weak school climate. The National Center for School Climate defines climate as the "quality and character of school life." It isn't something separate from the rest of the school; rather, it emanates from the relationships that exist between and among staff, students, family, and community. It is affected by the way discipline is handled in the school—how (and whether) problems are addressed. Lower smoking rates among high school students (Lovato et al., 2013). We could list other studies, but you get the idea—school climate matters; it informs how we work, teach, learn, and live. Unfortunately, it can be quite difficult to assess your school's climate from the inside. In addition, school climate isn't static—it shifts from day to day, depending on a variety of factors (e.g., who's present and who's absent, what happened over the weekend, whether the school is in the midst of statewide testing, how close the school year is to ending). Regardless of motivation, it is in our collective best interests to create safe places to work, teach, and learn. A three-pronged approach is essential—if one of the three components is missing, balance is compromised. Tier 1: This tier refers to the use of preventative behavioral supports across classrooms that generally meet the needs of about 80 percent of students. Tier 2: This tier refers to supports designed for the approximately 15 percent of students who misbehave frequently and require extended attention. Tier 3: This tier refers to interventions designed for the small number of students with intractable behavioral difficulties that are especially taxing to the school's resources. Supports in Tier 3 include more time-intensive tools than the other two tiers, such as functional behavioral assessments. The restorative approach to discipline incorporates principles of the SWPBIS approach to focus on prevention through relationship building by drawing on the collective strengths of the community to help individuals in trouble regain their footing in a nurturing environment with consistent classroom practices and high expectations. Most of all, restorative practices draw their strength from communication tools: adults use language that builds agency and identity and facilitate class discussions in a way that encourages affiliation and resolves problems. Restorative practices represent a positive step forward in helping all students learn to resolve disagreements, take ownership of their behavior, and engage in acts of empathy and forgiveness. Student Voices: "Your Kids Are Lucky to Have You"
Each chapter in this book ends with a "Student Voices" section. We frankly couldn't imagine writing a book about restorative practices without including student perspectives—after all, they are our "clients," "buying" what we have to "sell," and every good business talks regularly to its customers to find out what's working and to improve what isn't. Sephun came to us as a good student—he got great grades and was polite in class—but one who was also content to move through school without making much of an impression. Many students are like Sephun: they come to school, do what is asked of them and no more, and leave without being noticed. However, over time, Sephun came to discover that he could thrive as an agent for change. In the 9th grade, his contributions to class discussions earned him a reputation for being insightful, serious, and mature. By 10th grade, he was occasionally leading Socratic Circles in class. He joined the basketball team, where he used his social capital to positively influence teammates by showing them that it was OK for sports jocks to also care about academic achievement. Sephun now facilitates restorative practices workshops with Dominique, during which he explores the boundaries of his own leadership skills. In one workshop, a high school teacher asked the group for advice on increasing academic rigor while at the same time improving and deepening relationships with students. Sephun responded as follows: "I don't have any advice for you. I'm just a kid. But I want to thank you for being the kind of teacher who wants to be better and to push kids to be better. I go to a school where all my teachers are like that. Your kids are lucky to have you."